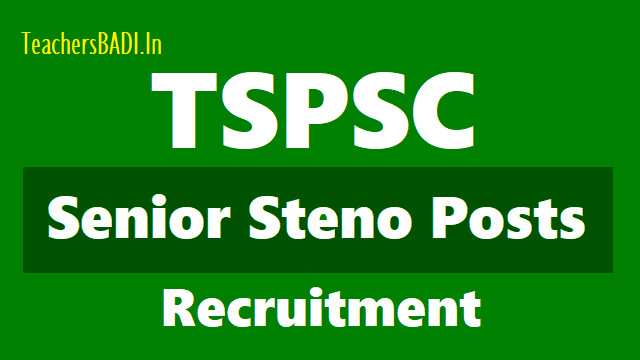 TSPSC Senior Steno posts 2018 Recruitment, Apply Online upto July 8, TSPSC Senior Stenos Recruitment 2018: TSPSC has given Senior Steno posts 2018 recruitment notification and Applications are invited Online from qualified candidates through the proforma Application to be made available on Commission’s WEBSITE (www.tspsc.gov.in) to the post of Senior Steno in Revenue Department in the state of Telangana, TSPSC Senior Stenos Online application form, How to apply for TSPSC Senior Stenos Recruitment, Last date to apply for Senior Stenos, Application fee, Eligibility Criteria, Senior Stenos Hall tickets download date, Senior Stenos Results date and more details are time to time available at tspsc website. స్టెనో పోస్టులకు వెలువరించిన ప్రకటనకు దరఖాస్తు చేసిన అభ్యర్థులు వ్యక్తిగత వివరాల్లో తప్పులు సవరించుకునేందుకు ఎడిట్ ఆప్షన్ ఇవ్వనున్నట్లు టీఎస్‌పీఎస్సీ తెలిపింది. ఆగస్టు 10 నుంచి 16 వరకు అభ్యర్థులు ఈ అవకాశం వినియోగించుకోవాలని పేర్కొంది. TSPSC Senior Steno posts 2018 Hall tickets Hall Tickets can be downloaded 07 days before commencement of Examination.